Click here to buy the Deluxe Hero of Legend costume at our custom costume page! From anyone who has met me on the road, they know that I am a big fan of Nintendo, mostly because of a few of their flagship series. I liked Metroid as a child, and with the Gamecube and Wii releases of Metroid Prime, I just got more excited. But nothing produced by Nintendo has been as exciting or influential as The Legend of Zelda series. From the original classic to what is considered to be the best video game of all time, A Link to the Past, Zelda has always been innovative and fresh. In 2003 when I learned of the sequel to Wind Waker, and that it would be presented as the most realistic and gritty Zelda ever, I started planning this costume. So now that I have finished my costume, it is time for me to pass on what I learned. When I began working on this costume, I decided that I wanted to go for the best of the best. Each piece was made by a professional in that field, i.e. seamstress, leather worker, etc. That means that the cost on my particular outfit is a bit on the pricey side, but you should be able to mimic it for less money if you need to. 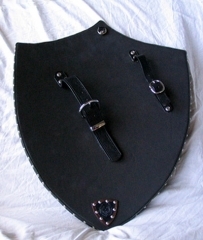 The crowning achievement of my costume, the shield was designed and built by me and Griffin of Griffin Leather Works. The curved shield is made of 2 sheets of 1/4 inch plywood, with multiple layers of leather on the front. 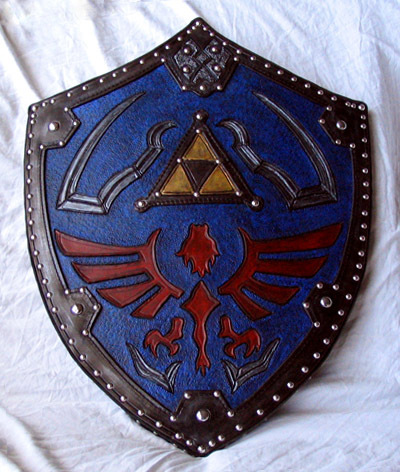 The design was taken almost directly from screen shots of Twilight Princess, with a few changes required for the leather medium. The leather stain resulted in a darker tone that I would like, so I am currently in the process of lightening the blue on the shield with some basic acrylic paint. The gloves are brown leather gloves from Wal-Mart. I forget the exact brand, but they come in both brown and black and were sold in the winter of 2006. They have thinsulate lining so they work great for colder weather too. I trimmed the lining out of the gloves, cut off the fingers, and sewed shut all of the seams that broke open cutting off the fingers. The gloves were $9.99 and took a few hours of work to get them ready. The bracer pads are a dark green suede. They wrap around the arms and attach via elastic straps to the three celtic buttons. They work great for holding down the end of the gloves. These were made by Griffin as well. Finally, the bracers themselves were tooled by Griffin and built by me. they are stained darker than the video game, but have the design straight from Twilight Princess. They attach under the arm via two buckles. The mail that I have is from Azon Corporation. I bought their short-sleeved tunic. It has the correct length for both the sleeves and the body. The links are very tiny, having a very elven look and feel (think Lord of the Rings mithril), and are all machine welded closed. The chainmail is steel, and weighs only about 7 pounds. Very strong and very light-weight. The best chainmail I have ever seen! These are my Minnetonka suede boots that I wear when working shows. I have also made some custom boot covers that wrap around the knee high boots. My boots are black, but I can’t bring myself to spending $200 on boots until I find the perfect ones. Another piece built by Griffin, this is designed straight from the video game. I should have some better pictures posted soon. 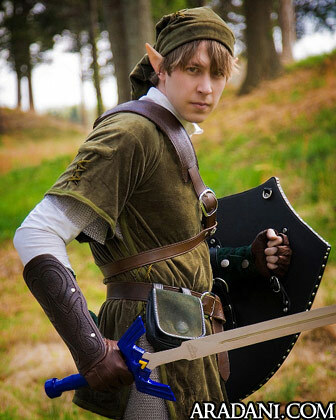 The hero’s tunic and clothes were made by a friend in Atlanta, GA. As with the rest of the costume, they were designed based on the official Legend of Zelda: Twilight Princess concept artwork. 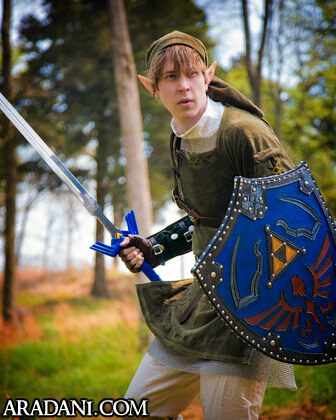 I will be working on taking more photos of the costume very soon, so keep checking this tutorial for more photos, details, and information on my Twilight Princess Link costume. 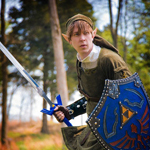 All of the photos here show my first version of the Master Sword, which I purchased at a convention. 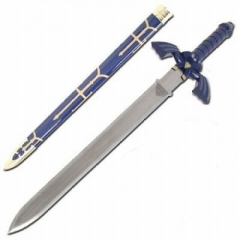 I was never a big fan of the blade, but everyone bothered me, “so where’s the Master Sword?” So I bought one. 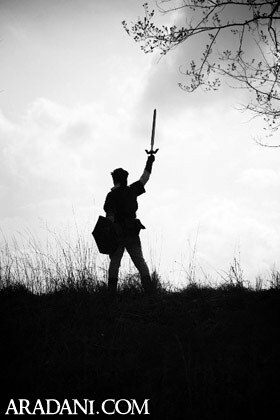 A young man sent me a link to a new design that was released earlier this year, and so I picked up a new sword. As with most replicas, it looks pretty, but it is definitely not a good sword. The weight on this blade is so top heavy, that it is actually difficult to hold, it always pulls on your wrist. However, it looks amazingly accurate to the Twilight Princess game, and came with a scabbard, so it was well worth the money. And with most replica blades, it can easily be found on eBay. I’ll leave you with the final photo that we took at our photo session, it was a fitting photograph. I think that about covers it. If you have any questions, feel free to email me at paul AT aradani.com. I would love to discuss the costume if you have any comments, if I have some free time. All full body photos of Paul were taken by Chip Talbert and are used with permission. They are also all amazing photos, Chip. Thanks so much for doing that.